It was a hot and dry day on Saturday for the first of Formula E’s double header races in New York City this weekend, and it turned out to be an eventful day. As the NYC race weekend is Formula E’s final of the 2017-18 season, the entire championship was on the line. Sunday, however, is shaping up to be a bit more of a knock down drag out fight for the closing win of the season. In order to clinch the championship, Jean-Eric Vergne had to finish a race victory’s worth of points ahead of Sam Bird, his next closest championship rival. Having started the race in 14th after an issue in qualifying resulted in his times being excluded, JEV had a fight on his hands to get ahead of Bird who started 9th on the grid. It was no small feat, but the championship leader ended up moving through the field with lightning pace and clinching that championship on Saturday with a fifth place finish ahead of Bird in ninth. The race winner was Lucas Di Grassi, who put on a hell of a show, passing teammate Daniel Abt for the lead in dramatic fashion. Di Grassi starts on pole for Sunday’s season ender, and has the potential to sweep the weekend’s results this afternoon. It should be a good fight, to say the least. If you haven’t been watching Formula E this season, check out the last race of the season, and the last race with the current generation of cars. It’s an uncomplicated series without any inane rules to follow for the weird motorsport anoraks-only crowd. 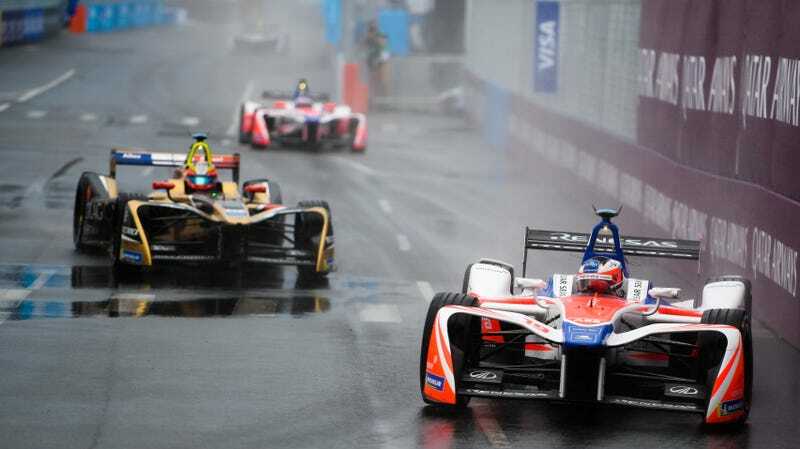 They race on the same Michelin tires, rain or shine—though today’s race could be the first wet weather ePrix in series history. They run a short sprint and the leader is the leader. There aren’t a lot of strategy calls to make, just passes on track. And the drivers, frankly, are world class. Next season should prove even better as the cars get more power and longer battery life (like, the full race) to play with. A new unconventional-looking race chassis, the Spark SRT05e, will also make its debut. Nissan, Mercedes, and BMW are all entering the series, while Renault is leaving. Lots of exciting changes to look forward to. Check it out as the 2018-19 season begins in Riyadh on December 15th.